Citroen's popular Saxo model was soon outgrown by others in the class so the French company introduced the C3 in 2002. Citroen's popular Saxo model was soon outgrown by others in the class so the French company introduced the C3 in 2002. With its arching roofline and curvy grille shape slightly aping Citroen's famous 2CV, the C3 shares some of that car's utilitarian nature. The digital dash added modernity, but the interior quality is firmly in the workmanlike camp; this is no soft-touch tactile delight inside - it's all hard and shiny, though robust, plastics. It is fairly unremarkable to drive, too, though the C3's key attributes are value and space. 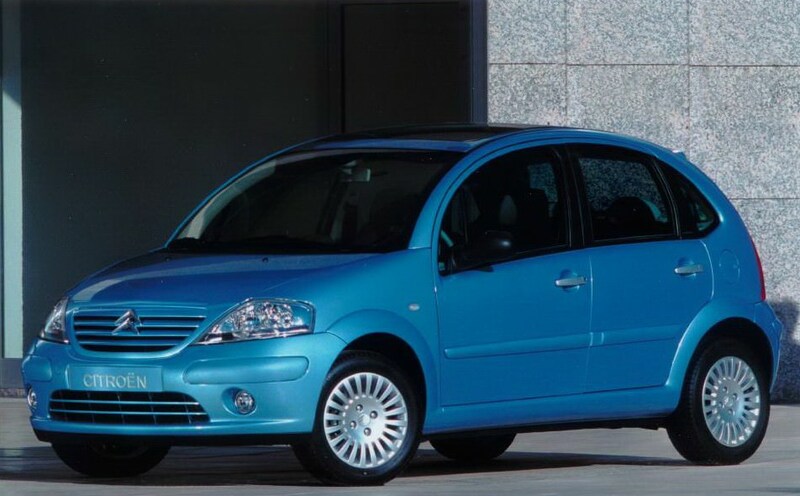 With emphasis on practicality and space the Citroen C3 was only offered in five-door hatchback guise - ignoring the C3 Pluriel cabriolet oddity that few Irish buyers opted for. The petrol engine line-up consisted of 1.1-, 1.4- and 1.6-litre units, while both 1.4 and 1.6 HDi turbodiesels were also available. All were mated as standard with a five-speed manual transmission, though Citroen did offer its 'Sensodrive' automatic transmission. Not a conventional automatic, but a 'robotised manual', it has a traditional automatic tw0-pedal layout, though without a torque convertor the shifts are rather cumbersome. The majority of sales were made up of cars with the manual transmission, allied with the 1.1-litre petrol engine. That entry-level unit delivers 61hp and returns 6.0 litres/100km on the official combined consumption cycle. The 1.4 adds 14hp and consumes 6.1 litres/100km and the rare 1.6 offers 110hp and combined consumption of 6.5 litres/100km - that improving to 6.2 litres/100km if fitted with the Sensodrive automatic. If economy is your ultimate goal then the diesels sip fuel more parsimoniously, the 70hp 1.4 HDi engine offering a combined consumption figure of 4.4 litres/100km and the 110hp 1.6 HDi 4.5 litres/100km. Their higher initial purchase price means they're not as readily available on the used marketplace, petrol models being more common. Trim levels included LX, SX and Desire. The C3 was facelifted in 2006 with a smarter front grille and revised front and rear lights, new bumpers and an improved interior. An XTR model, with pseudo-SUV looks thanks chunkier contrasting black bumpers and wheel arch over-riders, was also added, though it's rare in Ireland. A 1.1 LX is all you really need, and that's reflected in the used availability. It's got electric windows, body coloured bumpers and mirrors and central locking. Later models come with the better interior, but if you're after a spacious, no-nonsense supermini and are on a budget the C3 1.1 LX covers all bases. Spacious yet small, the C3 might be a practical choice, but it's very workmanlike. That's fine if you just want transport, but many rivals out there offer more fun from behind the wheel, even if they cannot offer the C3's space.